On my way from Winnipeg to Calgary I passed several museums and the BCATP Museum at Brandon was the first. My report consists of this page plus 5 pages of photos compiled with Adobe Photo Gallery (link at bottom page). Cessna T-50 'Crane 1' tailnumber 7729 (c/n 1172); this was a light commercial transport out of which the AT-17 'Bobcat' was developed for the military(Wikipedia), 822 Bobcats had been produced for the Royal Canadian Air Force as Crane 1s, many of which were used in the British Commonwealth Air Training Plan. 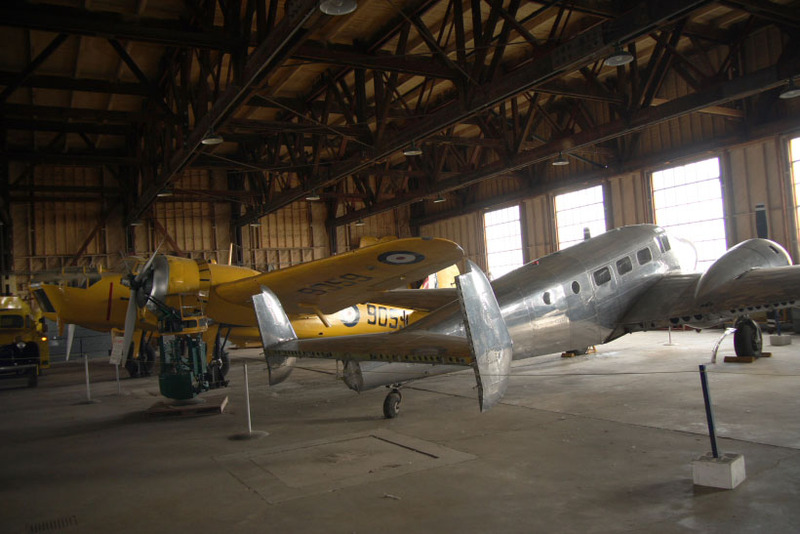 This museum is Canada's only museum dedicated to preserving the history and artifacts of the BCATP of 1939 - 1945. The museum's website offers more information and a visit is certainly recommended. In the foreground is Beech D18S Expeditor CF-BAS (c/n CA-57 / A-657). It was donated by Art & Don Gaffray of Silver Pine Air Services. This 'Twin Beech' was one of first Expeditors to be converted for civilian use and the conversion was done by British Aerospace. In the background is Bristol 149 Bolingbroke IV, tailnumber 9059. 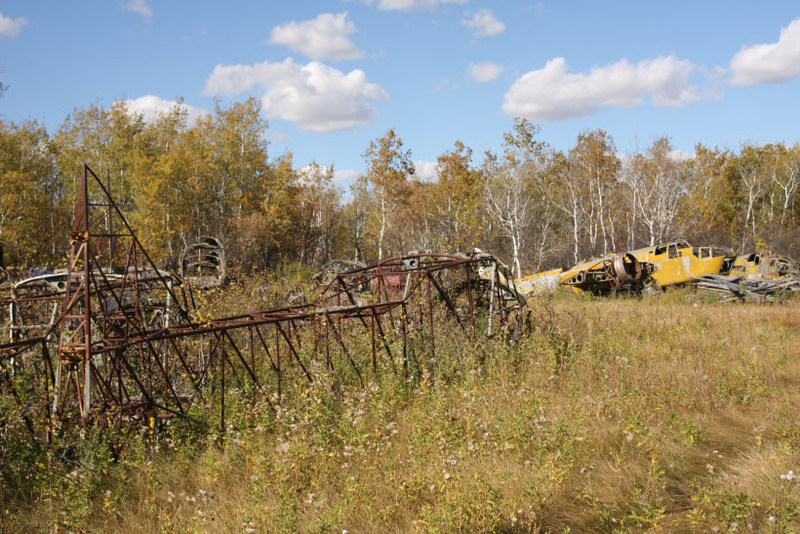 Several other Bolingbroke airframes were found in the remote compound, in various stages of dereliction , but some of them are not without hope for future preservation. The Bristol Bolingbroke is a Canadian-made variant of the Bristol Blenheim (high-speed light bomber), developed for training and anti-submarine tasks. The website www.HistoryofWar.org has further information. Construction of the school, in which the hangar is located , began on 14Nov1940 and was completed and opened for service on 10May41. Tha Hangar was one of five built at #12SFTS and was used to hangar the Cessna Crane aircraft which were used for pilot training. the hangar was decommissioned on 30Mar45. The museum opened in 1981. A note with the photos displayed in the Gallery: the camouflaged Harvard (20261 AE-V) was a visitor and depart soon after my visit and the Auster CF-KJP was a new addition. The airframe under restoration on page 2 (top, far right) is a Noorduyn Norseman. And the Bristol Bolingbroke at the end of the gallery is on display at the edge of town, with the Comfort Inn Motel. Ian MacDonald helped to solve this mystery: there are 2 aircraft involved here! Ian wrote: "CF-FVB served with the Saskatchewan Government Air Service as an ambulance aircraft. 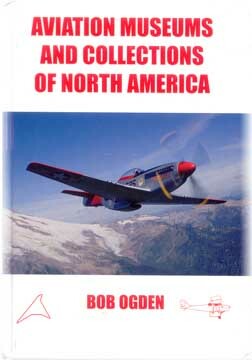 There is a photograph of it in Robert Parmerter's Beech 18 book on page 107. 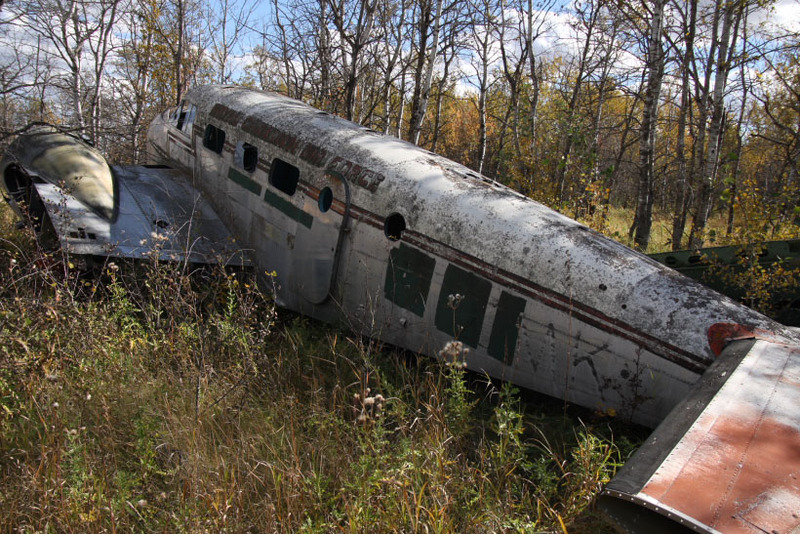 I last saw it in 1984, dumped behind the Parsons Airways base near Flin Flon MB. It was dismantled and in poor shape. So, yes, two different aircraft." 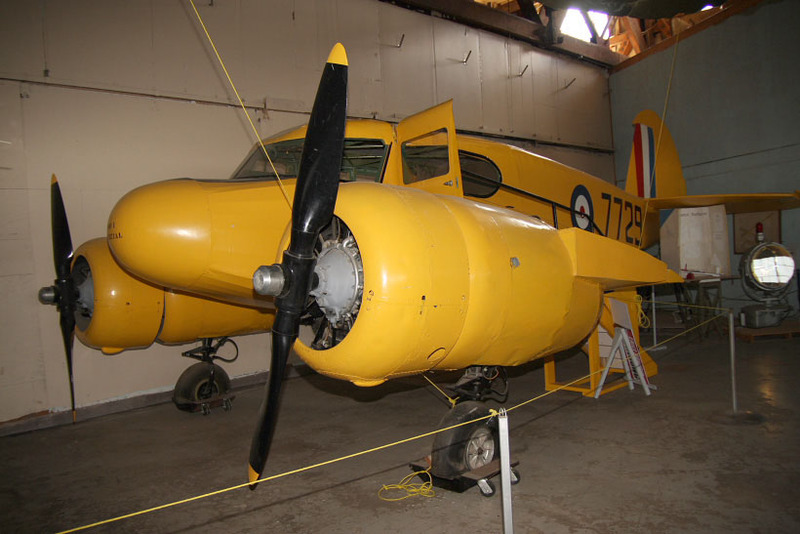 "This ex RCAF Expeditor II CF-FVB is the only Mk.II declared surplus prior to the 3T conversions, and was used by the Saskatchewan Government Air Ambulance program, from 1947 to 1969. Seen at Regina in 1972." The book lists c/n 6643 for CF-FVB. My sincere thanks go to Mr Reg Forbes O.M., Past President, who kindly allowed me access onto the compound (which is in a remote location, not at the Brandon airport).